The CPS, a secret government agency, is on a mission to seek and destroy the Hex - human mutants with supercomputer minds. They are young. They look like normal teens. They must never be allowed to grow up. But the CPS hasn't discovered Raven. Soon they will feel her power and know her rage. And even the best laid plans can go awry.. 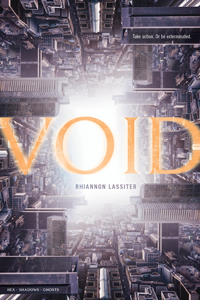 VOID was first published as the Hex trilogy and was accepted and published while Rhiannon was at university, reading English Literature at Oxford. It received rave reviews when first published and has since been translated into over ten foreign languages and performed as a play in Vienna, Austria. Visit the Hex trilogy page for more about the books, PDF downloads of the first chapters and extra game content.